Outdoor ballet performances are a rarity as they are quite tricky to stage, especially in countries with variable weather. Picture, then, some of the dancers from the Royal Ballet performing in the evening light, within the grounds of a famous 8th century abbey in the warmth of Southern France in July. 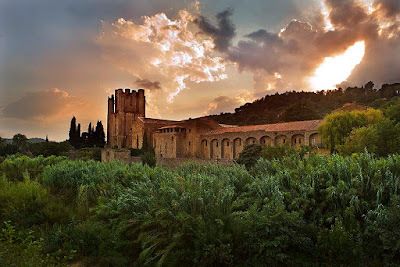 Lagrasse, a medieval village of artisans in the Corbières wine region of the south of France, is famous for its 8th century Benedictine abbey – St Marie d’Orbieu. The programme includes classical and contemporary rep with choreography by Kenneth MacMillan, Wayne McGregor, Will Tuckett and others. The inaugural event will be held on Saturday 17th July at 21.30, at The Abbey, Lagrasse, Aude, France. Doors open at 20.00 for refreshments in the stunning open air setting and the performance will last for 2 hours. In addition to the performance there will be three workshops in French and English, led by David Pickering, assisted by some of the dancers including Ludovic Ondiviela, who is French. The workshops are grouped according to level – so the first one is for beginners, open to all the family with an interest in ballet; the second is an intermediate workshop suitable for children already taking ballet classes; with the final workshop a professional class for aspiring male and female dancers who take ballet classes already. The first two workshops will be held in the Salle de Fêtes, in Lagrasse. For the third, advanced, class, there will be a charge which has yet to be set. Places will need to be reserved on a first come, first served basis and the class will take place on Saturday 17th July. Time and venue TBC. Please contact Emma Noon to reserve a place for the professional class on 00 33 4 68 43 68 60. Further details and photographs to follow. No outdoor performance is ever simple or easy. But it's the outdoor performances of the three tenors (Pavarotti, Domingo, Carreras)that brought Opera music to the masses; this will hopefully also happen with Ballet dancing. I'm looking forward for the photographs. I think that just like singing, outdoor ballet performances would not equate the maximum effects that can be attained indoors. But of course, since this type of performance is rare, it is much exciting to witness. p.s. would you consider exchanging links with my Creative Fashion blog? Oh how absolutely marvelous this sounds and how much would I love to be there. I do hope you will be able to go and report back! I love performances outside, if the weather permits. This has given me a lovely mental picture - a warm summer night, a glass of sauvignon blanc, the dark shadows of pine trees against a deepening indigo sky, and the Royal Ballet... >sigh< Talk about "a loaf of bread, a jug of wine, and thou..."
An outdoor ballet sounds incredible, and a ballet in Southern France in July sounds absolutely unreal! I am visiting your blog from the Duchess's blog. I am a huge fan of the ballet and this blog is just made for me. I am your newest follower. Hi Karen - lovely to see you here. The Duchess's blog is incredible so I'm very honoured that you've become a follower. Thank you for your lovely comment. Welcome ! Mimi - hello and welcome. Well, his tutu was covered quite a bit when he made it for ENB. If he does something in the future then I'm sure I'll cover it. pve design - the weather is key, isn't it ? Make Do Style - it certainly should be WOW ! Inspiration in Italy - lets hope it lives up to it's billing !